While there are certainly numerous storage companies in Escondido, only one is able to provide the convenience of storage unit delivery and pickup coupled with a low–price guarantee. 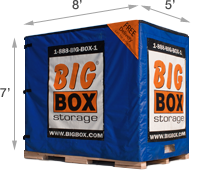 Big Box Storage provides portable storage throughout all of Escondido (zip codes 92025 and 92026 as well as 92027) as well as the surrounding areas. Those areas include Rancho Bernardo and also Rancho Penasquitos. 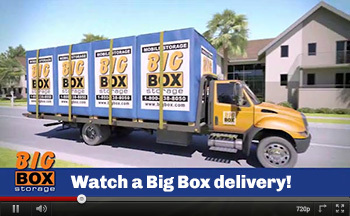 Instead of enduring the time and cost involved with having to rent, load, and unload a truck, simply call Big Box Storage at 760-453-0710 and have a “Big Box” delivered right to your Escondido home or business. Each Big Box storage unit can typically hold up to a room and a half of belongings (dimensions are 8’x5’x7’) which equates to approximately 50 medium boxes. Should you need assistance determining if one Big Box storage unit is sufficient to hold your items, please feel free to check the storage space estimator. Once the Big Box is packed at your Escondido address, it’ll be picked up for secure, indoor storing. Should you ever need to access your storage, you can do say any day of the week - and there’s never a charge to do so. For information on storage rental rates, please feel free to visit the pricing page or contact a representative at 760-453-0710. As noted above, Big Box Storage backs its rates with a low price guarantee. Should you find a lower rate with any Escondido competitor, the company will be pleased to not only match that rate, but beat it by an additional 10%. You will not find a better rate or a more convenient storage solution anywhere in Escondido. Once you know the date on which you’d like to begin renting storage space, the Big Box Storage staff will be pleased to schedule a delivery based on the date and time that works for you. Alternatively you may also schedule a delivery online and receive an instant $25 discount.